This is a machine pieced and quilted wall hanging based on the technique called Convergence. The design uses four unique fabrics; a sunflower batik, an Asian dahlia floral, a Lauren Burch Christmas print, and a red calico. The pieces were cut and reformatted in a grid of blue, red and green. The addition of an Asian dragonfly print and the golden batik enhance the complimentary colors of the squares to give the final design added punch. 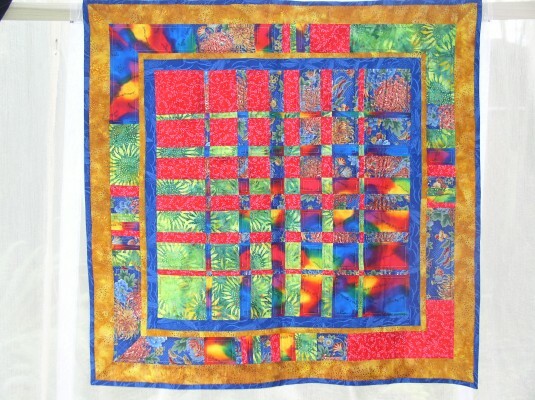 Each rectangular area has a colored rectangle quilted from the outside border. This quilt measures 34″ x 35″ and was donated to Operation Esperanza for their fundraiser auction in November 2005.